Happy National Cheese Lovers Day! I can't think of a better food to make a national holiday for. After all, who doesn't LOVE cheese? 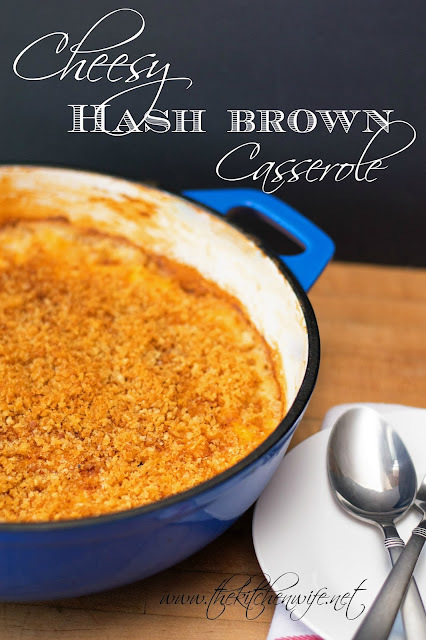 As soon as I found out about it, I knew EXACTLY what I wanted to make, a Cheesy Hash Brown Casserole Recipe. To begin you will need to preheat your oven 350 degrees. We're going to be using the butter for two different application in the recipe so you'll need to cut 2 tablespoons off of the stick and set to the side to use with the bread crumbs later. Then add the remaining 6 tablespoons and the olive oil to a deep pan, preferably an oven proof one, and allow the butter to melt as the pan gets hot. Once the pan is hot and the butter has melted, add the diced onion and cook until soft and translucent, about 1-2 minutes. Now add the flour to the butter, oil, and onion. Whisk it into the butter, oil, and onions to make a roux. Keep whisking for a couple more minutes to cook out the raw flour flavor. Now add the chicken stock to the roux. Bring to a simmer and whisk until the liquid thickens to make a gravy. This takes about 5-7 minutes. the sour cream to the gravy and whisk it until smooth. Now turn off the heat and whisk in 1 cup of shredded cheese. Keep whisking until the cheese is melted and the sauce is smooth. Stir into the sauce, taste, and make any adjustments you feel it may need. Now you can add the shredded potatoes. Even though I set these in the fridge overnight to thaw, they didn't completely do so, but that's fine. Just use your wooden spoon to break them up into the sauce. Give everything a good stir and spread it all out into an even layer. If you do not have an oven safe pan, this would be where you would transfer it into a great 9x13 baking dish. Now let's turn our attention to the crunchy, crumb topping. Remember those 2 tablespoons of better we set to the side earlier? Well not you are going to want to melt them over medium/high heat in a small skillet. Add the Panko bread crumbs. Then stir it all around and let the crumbs get nice and golden brown. It took about 2-3 minutes. 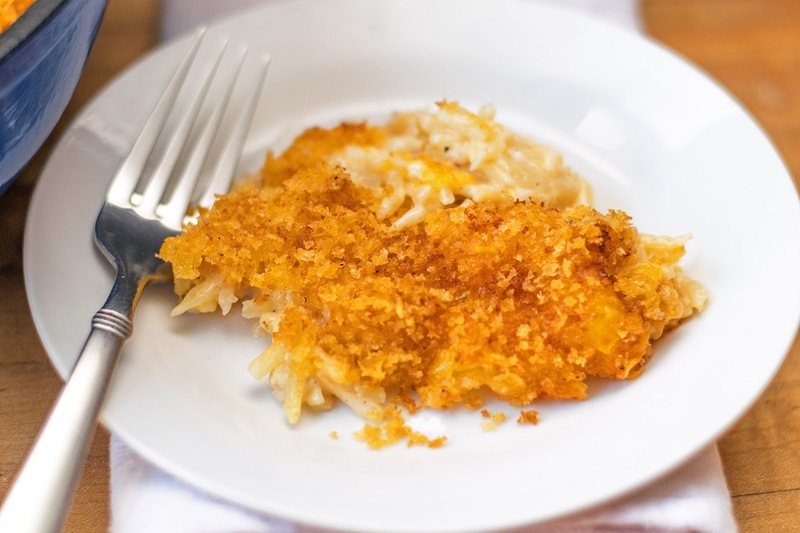 Now sprinkle the remaining cup of cheese over the top of the hash brown casserole to make it even MORE cheesy! And add those yummy, golden brown, panko bread crumbs on top of that! Lawd have mercy! I am drooling just thinking about all this cheesy goodness. Cover the casserole dish (whatever you chose to use) and place it in the preheated oven for 45 minutes. After 45 minutes remove the cover and place back into the oven for another 15 minutes. And now...YOU'RE READY TO EAT! I can't even explain how cheesy and bubbly this is. Cut 2 tbsp of butter from the stick and set to the side. Add the rest of the butter and the olive oil to a deep skillet, over a medium/high heat. When the butter has melted, and the pan is hot, add the onion and cook until soft and translucent. Next add the flour and whisk into the butter and oil. Cook for 1-2 minutes. Now add the chicken stock. Whisk into the roux (flour and oil) and bring to a simmer. Let simmer until it thickens into a gravy, about 5-7 minutes. Turn off the heat and add the cream cheese, sour cream, and 1 cup of shredded cheese. Whisk until smooth. Add the salt, pepper, seasoning salt, and garlic powder. Taste for seasoning and make any adjustments. In a small pan add the 2 tbsp. of butter and melt. Add the Panko bread crumbs, salt, and pepper. Cook until golden brown. 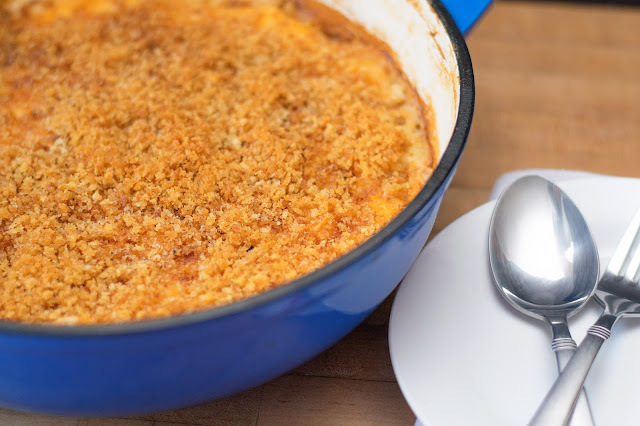 Now sprinkle the second cup of shredded cheese on top of the casserole and top with the bread crumbs. Cover and place in the preheated oven for 45 minutes. After 45 minutes uncover and bake for 15 more minutes. *If you do not have an oven-safe pan, this is where you would transfer it into a greased 9 x 13 baking dish. Hi! Love your recipes! How much sour cream is used in the recipe for the Cheesy Hash Brown Casserole? Thank you! Hey there! Thanks so much for leaving this comment! How could I have missed that! LOL It was 1/2 c and I will correct it now!